AMES, Iowa — Iowa State University will conduct a five-year research project that will study the impact of pipeline construction on crop production and soil compaction. Researchers began collecting initial data last fall on university-owned farmland near Ames on an approximately two-acre site following construction activities for the Dakota Access Pipeline. The overall goal of the project is to quantify the impact of construction utilities equipment, field traffic and deep tillage on crop yield and soil compaction. “The pipeline installation is an opportunity for field-based research that investigates the impact of utility construction and restoration practices on farmland, especially related to long-term crop yield and soil productivity,” said Mehari Tekeste, assistant professor of agricultural and biosystems engineering, who leads the project along with Mark Hanna, extension agricultural engineer. The research project, which will collect data through 2021, is funded by Dakota Access Pipeline LLC. Texas-based Energy Transfer Partners is building the $3.8 billion pipeline, which runs through North Dakota, South Dakota, Iowa and Illinois. In Iowa, the pipeline will cross about 5,740 acres of cropland, according to Dakota Access. The research site in Story County will be planted in a corn-soybean rotation. ISU research farm staff will maintain normal crop practices throughout the growing season, from tillage, planting, pest management applications and harvest. The pipeline’s route crosses about 18 acres of farmland owned by the university or university-affiliated organizations. Dakota Access completed construction and remediation activities last November, following the state-approved Agricultural Impact Mitigation Plan for farmland in Iowa. 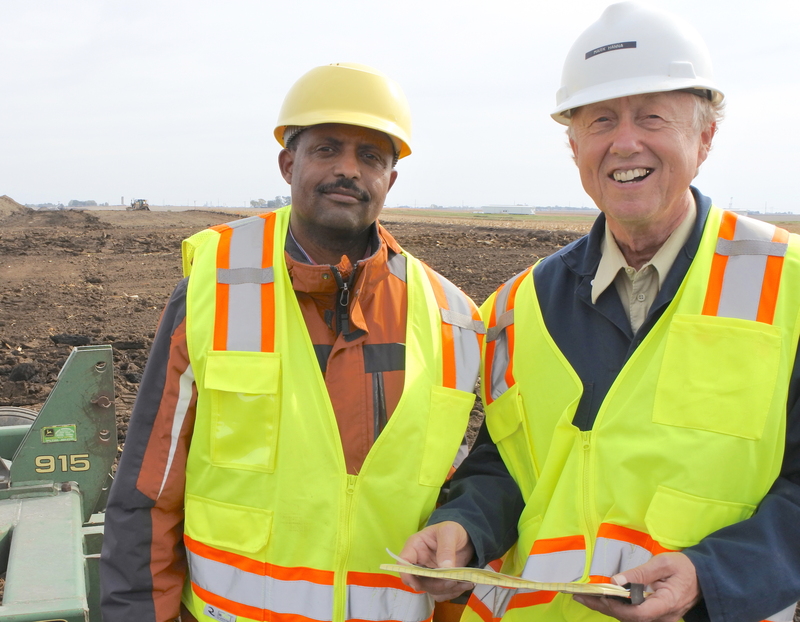 Mehari Tekeste, left, and Mark Hanna at the experimental site.